When you taste those wonderful fresh, flavourful fruits in the summer, many of us ask, “How can I have this all year round?” This is the reason why jam making has become so popular once again. At one time, it was how pioneers in this country preserved some of summer’s bounty, knowing they couldn’t just go to the grocery store and buy jars of jam! But today, there’s no comparison between what you buy that is commercially made and the preserves you make yourself. Fruits contain pectin, a natural thickening agent. Making jam the traditional way involves cooking fresh fruit with sugar and pectin so it makes a thick spread. Lemon juice is often added to keep the colour bright and help in preserving. 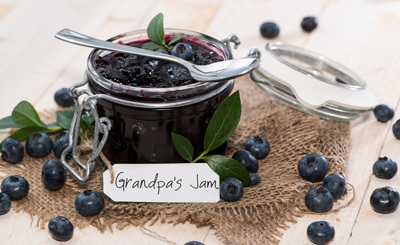 Sugar is required in order to preserve the jam (too little sugar and over time, the jam would grow mould!). Pectin is required in different amounts depending on the fruit or berry. If there is a lot of pectin in the fruit or berries (for example, black currants) you need little or no pectin, but for most jams, you add additional pectin. Pectin is sold in stores, often next to the cases of canning jars. The best recipes for jam are usually found in the pectin packages because each kind of fruit requires a different amount of pectin to set. Once the jam has been cooked, it is poured into sterilized jars (bought for the purpose with metal sealing lids). The jars are sealed so they can be kept in a cupboard without refrigeration. An easier method of making jam involves fruit, sugar and pectin, but the preserving is done by freezing. You don’t need sealing jars. In fact, you can use plastic freezer bags if you prefer. 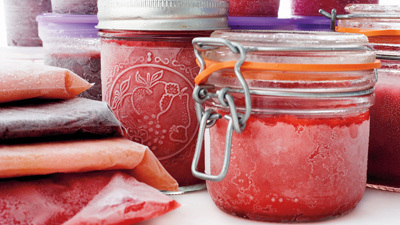 Because preserving isn’t an issue, freezer jams can use less sugar, if preferred. The taste is fresher and the colour bright because the mixture is brought to a boil but not cooked. Wash, rinse, and dry seven 8-ounce plastic freezer or glass jars with tight-fitting lids. You can also use zip-top freezer bags. In a medium pot, combine fruit and lemon juice. Whisk together sugar and pectin; add to fruit and bring mixture to a boil, stirring until sugar mixture dissolves. Boil 1 minute (no more), then remove from heat.